Farmers market report: Mandarin oranges are in season. We have recipes . - The Maghreb Times ! Home News Farmers market report: Mandarin oranges are in season. We have recipes . What’s in season: Known for their loose, easy-peeling skins, mandarin oranges are one of the sweeter offerings of winter, and the fruit is generally in season from late fall through early spring. Tangerines were one of the first varieties of mandarins imported to the United States, arriving from Tangier, Morocco. 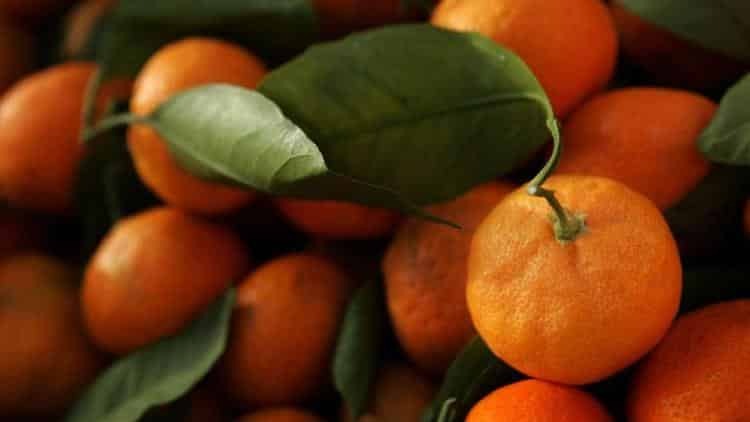 Today, other popular varieties include red-orange clementines and small Japanese Satsumas, as well as large Dekopon and tiny Ojai pixies. What to cook: While varieties vary slightly in flavor, mandarins are generally known for their sweet-tangy notes and make a perfect winter snack simply eaten out of hand. Peel the fruit and use the slices to lend bright color and flavor to salads, or juice the fruit and use as a base for marinades, sorbets, ice creams and jams. And remember to save the peel and add the zest to cocktails or baked goods. What’s on the horizon: Fennel, normally in season from late winter through early spring, is just beginning to show up. Note: From “Sunday Suppers at Lucques” by Suzanne Goin. 1. Slice the vanilla bean in half lengthwise and use a paring knife to scrape the seeds and pulp of one-half of the bean into a medium saucepan. Add half of the vanilla pod, the sugar and the water and bring to a boil over medium-high heat. 2. Meanwhile, remove the large white veins, or pith, from the tangerine segments. 3. Reduce the heat to low and add the tangerines to the syrup. Simmer the fruit until the tangerines look a little puffy and shiny, 3 to 5 minutes. 4. Strain the mixture over a bowl and discard the vanilla pod. Return the liquid to the pan and reduce over medium-high heat until it’s slightly thickened and coats the back of a spoon. 5. Allow the syrup to cool completely and gently stir in the tangerines. 1. Heat the oven to 375 degrees. Brush a 10-inch round cake pan with 1 tablespoon olive oil. 2. Sift the flour and baking powder together and then stir in the couscous and salt. Combine 1 cup olive oil and the brandy in a small bowl. 3. Using a stand mixer fitted with the whisk attachment, beat the eggs, yolks and sugar on high speed for 7 minutes. Remove the bowl from the mixer and alternate folding in the dry and wet ingredients, a third at a time. Pour the batter into the prepared cake pan. Tap the pan on the counter three times to remove any air bubbles. 4. Bake until the cake begins to pull away from the sides of the pan and a knife inserted into the center comes out clean, about 30 minutes. The cake should be golden brown and spring back slightly when you touch the center. Cool the cake on a rack for at least 15 minutes. 5. Using a stand mixer fitted with the whisk attachment, whip the cream and creme fraiche together to soft peaks. 6. Cut slices from the cake and place them on dessert plates. Spoon some of the candied tangerines and syrup over each piece and dollop with the whipped cream. Each serving: 530 calories; 6 grams protein; 53 grams carbohydrates; 1 gram fiber; 32 grams fat; 9 grams saturated fat; 244 mg. cholesterol; 187 mg. sodium. Next articleCAIM hails Algerian police’s cooperation with Arab.